This guest blog was written by Adarian Barr, Assistant Track Coach, Jump/Hurdles/Multi-events at the University of North Carolina in Pembroke. To read Adarian’s past articles, click here as well asmy Freelap Friday Five with him. Make sure you read Part 1 in What is the Drive Phase in Sprinting? Part 1 and Part 2 before reading this article. 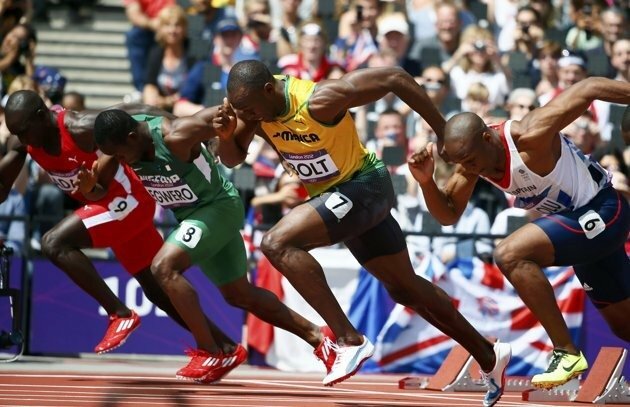 The big mystery in track and field is force application. How do we explain force application? Force production is easy contract a muscle, But application? That is the hard part. The most often used phase given to how to increase one’s performance is to increase your force application. The question most often asked is how do I increase my force application? The next question is directional control of force application, how do I apply the most force in the desire direction? Last time I talked about drive phase and what it is, that was based on shin angles. Then I talked about how to set up shin angles. Now I am going to talk about force application. Force application is still shin angles. You have to set up your shin angles to apply force and control the direction of the force. You have to get the greatest amount of force applied in the direction you want to travel. Pushing is force application. I like to say push off harder rather than push harder. What is the difference you say? You push a car or a wall, but if I am the thing or object that I want to move then I want to push off the wall to push myself rather then just push the wall. Same thing with the ground I want to push off the ground rather than push the ground. If you are going to launch a boat, do you push off the ground to push the boat or do you push the ground? Do you push off the wall to move away from it or do you push the wall. Why does this matter? Intent dictates behavior in movement patterns. You can’t push from your toes as toes are meant to grip. The gripping toes create stability for the push off. This is the key to force application and push mechanics when starting from a standstill (traction). The sequence to force application from a standstill goes like this, stand on toes, from tip to MTP joints toes, your knee has to come over and past the toes and lower itself until the optimal shin angle has been attained, then the hips move forward and align over the knee and that is when glutes fire to push yourself in the intended direction. The angle of the shin will dictate which direction vertical or horizontal. The confusion comes in with leg extension versus hip extension. Just because your leg straightens out does not mean you are pushing. The leg straightening could come from the quad extending the knee (knee extension), could come from the doing a toe raise and the best is it should come from the glutes creating hip extension. The key is look for hip extension and not knee extension. How can you tell the difference? The knee needs to hold steady for the glutes to fire. If the knee rises up then that is quad activation and not the best way to apply force in this situation. With the knee in front of the toe and the hip over the knee the force is applied downward to the toes to create traction, now you have the greatest amount of grip. This gives the brain the signal to increase fore production which will give you greater force application. This also allows for the glutes to push the hips forward as you push off from the ground to push yourself in the intended direction. The ground is stable, the foot is stable the knee down to the calf is sable as no movement takes place from the knee down to the foot, the movement of the push takes place at the hips. The force during force application should be applied to the hips. This one action creates a few other reactions, which will be discussed in the next series. Adarian Barr is the Assistant Track Coach, Jump/Hurdles/Multi-events at the University of North Carolina in Pembroke. 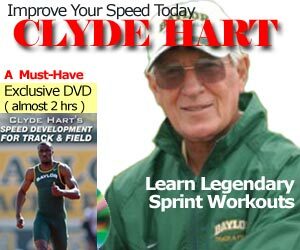 He is also Movement Specialist and Track & Field coach with Next Level Athletics and Fitness, as well as the inventor of PALO.